"Bagasse is a waste plant matter obtained by food industry processes such as beer brewing, plant oil extraction or sugarcane processing for production of bioplastic. It is an underutilized agro-industrial residue that often gets incinerated to produce heat and electricity or used to make fodder..."
Unique research requires unique equipment to achieve unique results. We researchers want to innovate, we want to create unique things, in accordance we need an unique system. REGEMAT 3D the world leader in the development of bioprinting technologies and its clinical applications is the only company worldwide that customizes your system to your specific application. Bioimpresión, ¿una alternativa al trasplante de órganos? Esta técnica ha surgido durante los últimos años como una tecnología para crear tejidos vivos que regeneren lesiones y órganos por medio de la impresión 3D de materiales y células. La bioimpresión ha surgido durante los últimos años como una tecnología para crear tejidos vivosque regeneren lesiones y órganos por medio de la impresión 3D de materiales y células. Sin lugar a dudas, esta una tecnología prometedora, pero ¿cómo de lejos están los científicos de crear tejidos y órganos funcionales que puedan implantarse en seres humanos? En este contexto, Regemat 3D, empresa con sede en Granada (España), es una institución puntera en el desarrollo de tecnologías de bioimpresión 3D y que, además, cuenta con usuarios en más de 20 países. La empresa española cree en las ventajas y el potencial de la tecnología, así como en sus innumerables aplicaciones, pero aún hay mucho trabajo por hacer e hitos por resolver. Es el momento de investigar aún más un área que está en su momento más álgido y que, durante el último año, ha aumentado considerablemente el número de soluciones y resultados publicados relacionados con nuevos desarrollos. "Con la impresión 3D es posible ofrecer una solución personalizada que combine un dispositivo médico sintético con uno biodegradable"
El fundador y CEO de Regemat 3D, José Manuel Baena, es también fundador de Breca Health Care, compañía especializada en el diseño, fabricación y comercialización de prótesis e implantes a medida desde el 2011 y una de las primeras compañías en todo el mundo en implantar un implante impreso en 3D. En este sentido, Baena apuesta por la combinación de dispositivos médicos sintéticos hechos a medida y estructuras bioimpresas para regenerar una lesión. "En el pasado, si querías hacer una reconstrucción con biomateriales que se biodegradan, la geometría y el rendimiento de los dispositivos médicos lo restringían. Ahora y gracias a la impresión 3D, es posible ofrecer una solución personalizada que combine un dispositivo médico sintético con uno biodegradable, incluso pueden contener células autólogas del paciente para mejorar la regeneración", señala el CEO de Regemat 3D. "Si un investigador quiere innovar, quiere crear cosas únicas, necesita una bioimpresora única que cumpla con sus necesidades reales y genere resultados novedosos"
El propio José Manuel Baena aclara que, actualmente, "la integración con los tejidos circundantes no ocurrirá instantáneamente, pero un dispositivo médico sintético hecho a medida ayudará a mantener la estructura y promoverá la integración del tejido vivo bioimpreso. Hay muchas oportunidades y aplicaciones de bioimpresión e impresión 3D a corto plazo, utilizando o no células vivas". En este contexto, la plataforma Regemat 3D para bioimpresión consta de hardware y software personalizado para cada aplicación, ya que cualquier nuevo biomaterial y tejido necesita su propio dispositivo. "La bioimpresión 3D es el conjunto de una amplia gama de tecnologías, no solo una. Si un investigador quiere innovar, quiere crear cosas únicas, necesita una bioimpresora única que cumpla con sus necesidades reales y genere resultados novedosos", sentencia Baena. Bioprinting has emerged during the last years as a promising technology for creating living tissues to regenerate injuries and organs. Without any doubt it is a promising technology but, how far away scientists are from creating functional tissues and organs that can be implanted in human beings? Hype or reality? 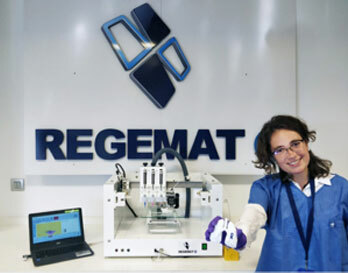 REGEMAT 3D, a technology based company based in Granada, Spain, is pioneering the development of bioprinting technologies. The Spanish company thinks that the advantages and potential of the technology are countless but still there is a lot of work to do and milestones to solve. It is a great time to get involved in this area as a researcher, and the number is increasing during the last year as well as the results and solutions. REGEMAT 3D’s founder and CEO, José Manuel Baena, also founded BRECA Health Care in 2011, one of the first companies worldwide to implant a 3D printed implant (reference to BRECA HC activity article @BRECAHealthCare) , sees a lot of opportunities in the combination of 3D printed custom made synthetic medical devices and bioprinted structures to regenerate an injury. “In the past if you wanted to do a reconstruction using biomaterials that biodegrade, you were restricted by the geometry and performance of sized medical devices. 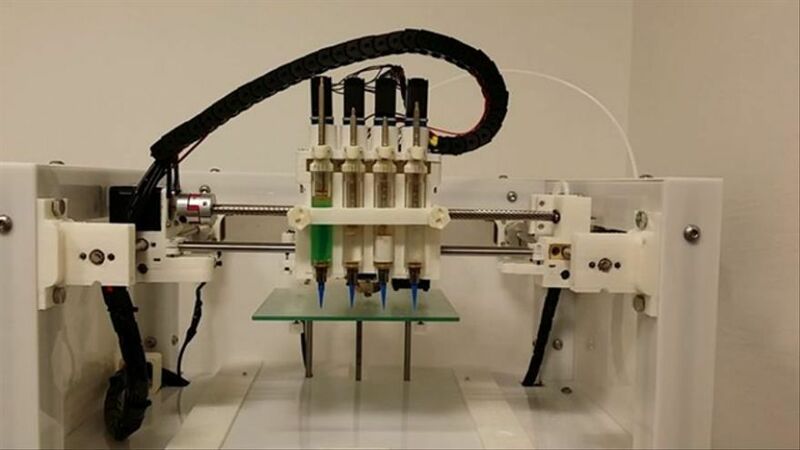 Now with 3D printing you can offer a customized solution combining a synthetic medical device with a biodegradable bioprinted one and even autologous cells of the patient to enhance the regeneration. Even if you could create in the lab a functional tissue, the integration with the surrounding tissues is not going to occur instantly. A custom made synthetic medical device will help to hold the structure and promote the integration of the bioprinted living tissue. There is a lot of opportunities and applications of bioprinting in the short term, even without the printing of living cells” Baena said. 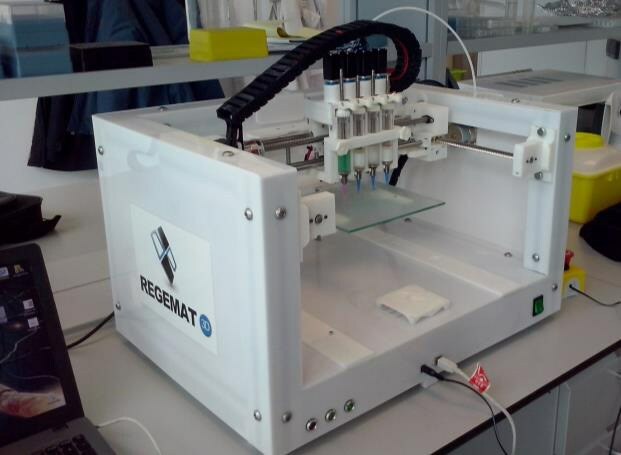 REGEMAT 3D platform for bioprinting, consisting in hardware, an electronic control unit, and software is customized to every application as any new biomaterial and tissue needs its own device. “There are another bioprinting companies that are selling this kind of machines “in batch” saying that with one system you can print many different tissues. This is not true. Also bioprinting as 3D printing is a wide range of technologies not just one. Researchers want to innovate, they want to create unique things, in accordance they need and unique system. A bioprinter is not a microwave” Baena said. The company based in Granada, Spain was founded in 2015 to transfer to the society the results of a project developed by the founder Jose Manuel Baena and Professor Marchal from 2011-2013 focused on cartilage cells. Now the company has systems in more than 20 countries and is steadily expanding. “We focus on quality, not on quantity. We get involved in the research project with our users. For us it is not about to sell as many bioprinters as we can, is about to get results that help us to bring from lab to bed as many as innovative therapies as we can. There are still many milestones to overcome in bioprinting to create functional tissues, Don´t be fooled by the current hype. We are working on that. We were already successful in bringing 3D printed implants and prosthesis with BRECA Health Care to the clinical application and the results are incredible. It is a matter of time and effort” Baena said. La biomedicina está viviendo su peculiar siglo de oro: junto a las nuevas técnicas cada vez más celulares, cada vez más moleculares, cada vez más personales, se están desarrollando nuevos dispositivos médicos que también podrían crear estructuras, prótesis o tejidos sintéticos a medida. De tecnología 3D adaptada al universo biomédico hablamos esta noche con José Manuel Baena, investigador asociado del Grupo de Terapias Avanzadas, Regeneración y Cáncer del IBIMER, de la Universidad de Granada. En formato breve más información científica, sin olvidarnos de las efemérides de la semana. What’s your backstory? I mean, what made you first become interested in bioprinting and how did you translate that interest into the creation of a powerful player in the bioprinting industry? “I was born in Valencia in October 1983. I studied engineering in Valencia, Spain; Braunschweig, Germany; and Oxford, UK, where I got my MSc in Motorsport engineering supported by the grant program of F1 world champion Fernando Alonso. I have also studies in biomedical engineering in Buenos Aires, Argentina, and I am finishing my PhD in Biomedicine in the University of Granada. Many years ago I decided to focus my career in the intersection between engineering and medical sciences. I could have worked designing cars but medical devices were more motivating and challenging for me. Ten years ago I was a researcher designing custom made implants and thought that 3D printing could be used for doing amazing customized implants. In 2010 I started working on the BRECA Health Care Business plan. The company was founded early 2011, at that time 3D printing was not as popular as it is now. Many people told me I was never going to be able to bring it to clinical applications, but now we have dozens of successfully clinical cases around the world. Can you tell me a little bit about your personal vision for 3D bioprinting? While it clearly has implications and applications in a number of fields, what’s the one that makes you most excited to think about? “I think now bioprinting is in a kind of hype. Biological sciences can benefit a lot from these ranges of different technologies but it is not true that we are going to be printing functional organs in the short term. You can say that to do an IPO and get funding but after some years when results don’t come as expected you are going to fall (such as in the case of Organovo). I saw it also many years ago with 3D printing in medical devices, then after that the curve of expectations decreases, a lot of detractors arise. Only when you can show results does the technology start being used and find a place in the market. Also it is important to make clear that what we print with a bioprinter is not a tissue; it is a matrix, a scaffold, with cells in 3D that, as we showed many years ago, behave in a similar way to the cells in vivo, but still a further procedure is needed to have the functional tissue implanted. 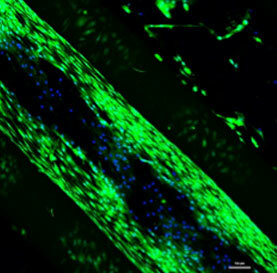 Mechanical stress after printing and other factors play an important role in the outcomes for the tissue. We think of bioprinting as an amazing range of technologies to achieve our aims as researchers that want to mimic living structures but there is still a lot of things to do to cover all tissues. That is why we in REGEMAT 3D offer not just a bioprinting system but a customized one for every specific application. When people outside of the field think about bioprinting their heads may be filled with images of ready-to-use organs coming off a print production line; what do you see as the biggest misconception about the possibilities offered through bioprinting? Living and working in Granada, can you give me an idea of what are the strengths and weaknesses of 3D printing are in Spain itself? Is 3D printing fairly well established as part of the manufacturing culture or is it still a struggle to integrate it into the contemporary marketplace? “Granada is a wonderful city to live in and start a company. The quality of life is very high, cost of living low, good weather, beautiful sky, and beaches in less than 40 minutes drive. The University of Granada is one of the biggest in Spain with a strong background in medical sciences and engineering. It is easy to find excellent engineers at a very competitive cost, that is one of the reasons our customized model is working, you cannot do it with engineers in USA, Sweden, or Switzerland, for example. What do you see as the next big issue to be addressed in 3D bioprinting? “For me 3D bioprinting is another technology, actually a range of different technologies, to create living tissues, that has a lot of potential in offering solutions for many of the medical problems we face today. But there are still a lot of things to do. In my opinion, after the current hype it is important to have solid results that help bring the technology to specific applications. Both technical improvements and regulatory achievements are the biggest issues to be addressed. As in the 3D printing of medical devices industry, that I know quite well from many years, it is a matter of effort and time to get the right results and validation to be able to move from lab to bed. You are also behind the startup BRECA Health Care, which specializes in the design and manufacture of custom-made medical devices, and recently you’ve been working to provide surgical guides for pediatric neurosurgery. What has been the greatest challenge you faced in developing this product? You seem to be able to keep a lot of balls in the air at once. Aside from Regemet and BRECA are there any other ventures that you are involved in that we should know about? “Not really. Sometimes I teach in business schools or universities but just a few hours a year. In the past, I have helped another projects but just in the very short term. I get quite a lot of proposals for new technology based ventures as my technical background is quite broad, but I don’t want to lose the focus, as the activity associated with my two companies and their internationalization, and my hobby, research and science, take all my time. I am in health care as a vocation and I don’t want to spend time in other sectors. I could be designing F1 cars, but I prefer to work on the most amazing machine of the world, the human being. There are still many things to do and at the end of the day we want new health care solutions, because at some point in our lives we all are going to need it. This is the only race I want to be involved in. What are your hopes for your companies in the coming year? How about in the longer term? “We want to keep developing new customized solutions with BRECA Health Care and with REGEMAT 3D and help our users keep producing the results that help bring new solutions based on bioprinting and regenerative medicine to patients. For us this is not about selling a lot of machines, it is about the results and the quality. There are another bioprinting companies that are selling this kind of machines ‘in batch,’ saying that with one system you can print many different tissues. This is not true. Researchers want to innovate, they want to create unique things and accordingly they need unique systems. A bioprinter is not a microwave. That is why based on our software and hardware we customize the system to the application. We recommend them to start with V1 and once they know the technology better, we develop a customized one and replace the other one. We focus on quality, not on quantity. We get involved in the research project with our users, we want them to get results that help us to bring from lab to bed as many innovative therapies as we can. There are still many milestones to overcome in bioprinting to create functional tissues, don’t be fooled by the current hype. We are working on that. We were already successful in bringing 3D printed implants and prosthesis with BRECA Health Care to the clinical application and the results are incredible. It is a matter of time and effort. We see other companies doing IPOs and a lot of marketing focusing on batch production and the market of labs. But in my opinion this is not going to succeed as in an IPO founders lose control and need to increase the structure costs and lose flexibility, if the results don’t come then you are in trouble. And although the lab market is more mature than others for bioprinting products, researchers want to do unique things, so they need unique devices. Also having a strong background in the clinical practice makes a difference in the mid and long term. Other bioprinting companies do not have this background, nor do they have the sales network for medical devices we have created during the last years. I think ours is the model that is going to succeed in the medium and long term. I am not new in the industry. In the last 7 years I saw many startups fall. For us it is important to base our activity strongly and move with the right timing. In my book Emprender Carreras, I explain the methodologies that we use to make decisions based on planning data acquisition and creating models to evaluate different scenarios. What advice would you give to the next generation of would-be 3D print experts as they prepare themselves? ¿Llegará a ser la bioimpresión una alternativa a los trasplantes de órganos? REGEMAT 3D empresa líder en medicina regenerativa afrontará nuevos retos en el área de bioprinting en 2018. La bioimpresión ha surgido durante los últimos años como una nueva tecnología para crear tejidos vivos que regeneren lesiones y órganos por medio de la impresión 3D de materiales y células. Sin duda, es una tecnología prometedora, pero ¿cuán lejos están los científicos de crear tejidos y órganos funcionales que puedan implantarse en seres humanos? ¿Burbuja o realidad? REGEMAT 3D, empresa con sede en Granada, España, está liderando el desarrollo de tecnologías de bioimpresión 3D y cuenta con usuarios en más de 20 países. La empresa española cree en las ventajas y el potencial de la tecnología, así como en sus innumerables aplicaciones, pero aún hay mucho trabajo por hacer e hitos por resolver. Es el momento de investigar aún más en esta área, están en su momento más álgido y durante el último año han aumentado considerablemente el número de soluciones y resultados publicados relacionados con nuevos desarrollos. El fundador y CEO de REGEMAT 3D, José Manuel Baena, es también fundador de BRECA Health Care compañía especializada en el diseño, fabricación y comercialización de prótesis e implantes a medida desde el 2011 y una de las primeras compañías en todo el mundo en implantar un implante impreso en 3D. JM Baena apuesta por la combinación de impresión 3D dispositivos médicos sintéticos hechos a medida y estructuras bioimpresas para regenerar una lesión. “En el pasado, si querías hacer una reconstrucción con biomateriales que se biodegradan, la geometría y el rendimiento de los dispositivos médicos lo restringían. .Ahora, con la impresión 3D, es posible ofrecer una solución personalizada que combine un dispositivo médico sintético con uno biodegradable, incluso pueden contener células autólogas (propias) del paciente para mejorar la regeneración. Siempre hay que aclarar que, actualmente, incluso si se pudiera crear en el laboratorio un tejido funcional, la integración con los tejidos circundantes no ocurrirá instantáneamente, pero un dispositivo médico sintético hecho a medida ayudará a mantener la estructura y promoverá la integración del tejido vivo bioimpreso. Hay muchas oportunidades y aplicaciones de bioimpresión e impresión 3D a corto plazo, utilizando o no células vivas “, JM Baena, CEO BRECA Health Care. La plataforma REGEMAT 3D para bioimpresión, consta de hardware y software personalizado para cada aplicación, ya que cualquier nuevo biomaterial y tejido necesita su propio dispositivo. “Hay otras compañías de bioimpresoras que venden este tipo de máquinas “fabricadas en serie” y afirman que con un sistema se pueden imprimir muchos tejidos diferentes. Esto no es verdad y mucho menos en el caso de órganos más complejos. La bioimpresión 3D es el conjunto de una amplia gama de tecnologías, no solo una. Si un investigador quiere innovar, quiere crear cosas únicas, necesita una bioimpresora única que cumpla con sus necesidades reales y genere resultados novedosos. Una bioimpresora no es un microondas “, JM Baena, CEO BRECA Health Care. La empresa con sede en Granada, España, se fundó en 2015 para transferir a la sociedad los resultados de un proyecto desarrollado por el fundador José Manuel Baena y el profesor Juan Antonio Marchal entre 2011 y 2013 centrado en células de cartílago. Ahora la compañía tiene sistemas en más de 20 países y está en constantemente expansión. “Nos enfocamos en la calidad, no en la cantidad. Nos involucramos en el proyecto de investigación con nuestros clientes y colaboradores. Para nosotros no se trata de vender tantas bioimpresoras como podamos, sino de obtener resultados que nos ayuden a desarrollar tantas terapias innovadoras como podamos. Todavía hay muchos hitos que superar en la bioimpresión para crear tejidos funcionales, y órganos, no se deje engañar, es un campo con muchísimo potencial de desarrollo pero todavía queda mucho trabajo por hacer. Nuestra compañía está teniendo un gran éxito trabajando con la parte biodegradable y celular bioimpresa unido a medical devices impresos en 3D, en colaboración con BRECA Health Care, cuya unión permite afrontar aplicaciones clínicas en el corto plazo, los resultados están siendo increíbles. Es una cuestión de tiempo y esfuerzo “, JM Baena, CEO BRECA Health Care. Por ejemplo en la facultad de medicina de la Universidad de Sídney han conseguido regenerar en el laboratorio tejido cardiaco necrosado, es decir recuperar tejido muerto tras un infarto. En México estamos preparando un ensayo clínico (en seres humanos) para regenerar lesiones de cartílago a partir de una resonancia magnética. El campo de aplicaciones es enorme. El futuro prometedor pero todavía queda mucho por hacer. Will bioprinting be an alternative to organ transplantation? REGEMAT 3D is a biotech company focused on regenerative medicine and pioneer in a promising area called bioprinting, that uses 3D printing technologies for regenerative therapies. We develop our own bioprinting systems and customize it to the applications of our users. ¿QUIERES CONOCER MÁS SOBRE LA BIOIMPRESIÓN 3D? There are a few companies that immediately come to mind when 3D bioprinting is mentioned- Organovo and EnvisionTEC among them, for example. But bioprinting isn’t just the domain of a few – there are many, many organizations out there working with living tissue using 3D printing technologies. One of those companies is REGEMAT 3D, a Spanish startup focused on regenerative medicine. REGEMAT 3D is pioneering the development of bioprinting technologies. The Spanish company thinks that the advantages and potential of the technology are countless but still there is a lot of work to do and milestones to solve. It is a great time to get involved in this area as a researcher, and the number is increasing during the last year as well as the results and solutions. The original version of the platform was designed to treat cartilage degeneration and degenerative joint diseases, due to the frequency of these types of ailments. In the last three years the company has expanded the use of the system to other tissue applications. Drug development is another area of interest. 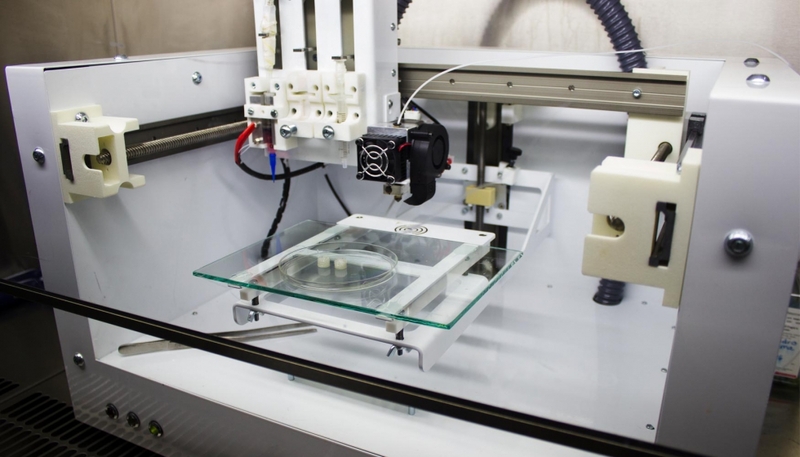 If a user needs a bioprinter for another application, however, they only need to specify what and REGEMAT 3D will develop a system to meet their needs. 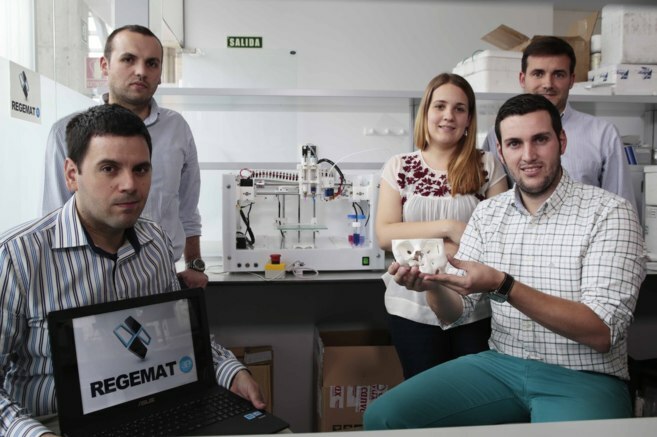 REGEMAT 3D, which is based in Granada, was founded in 2015 following a project on cartilage cells carried out from 2011 to 2013 by Baena and Professor JA Marchal at the Regenerative Medicine Institute (IBIMER), Centre for Biomedical Research (CIBM), University of Granada. The company now has systems in more than 20 countries and continues to expand. Reconocidos expertos en fabricación aditiva de diversos sectores cómo el aeroespacial y el biomédico darán su punto de vista sobre la actualidad y el futuro éxito en la impresión 3D a nivel profesional. Los ponentes analizarán la implantación de las nuevas tecnologías en los diferentes sectores, así como la aplicabilidad en sectores potenciales. Adicionalmente se expondrá el impacto de la tecnología en aspectos clave como la cadena de suministro, y como lograrlo a través de la ingeniería aditiva. Estas ponencias sobre temas estratégicos se complementarán con charlas técnicas igualmente cruciales en el desarrollo de producto, como la fatiga y la certificación de productos para el sector aeroespacial, aplicaciones prácticas de la optimización topológica desde la óptica de la fabricación aditiva y se presentará en profundidad la nueva tecnología MJF de HP. Por último, analizaremos la bioimpresión de tejidos 3D, cuya ponencia la realizarán representantes de Regemat, primera empresa española en fabricar una bioimpresora de tejidos. EDDM organiza este evento en el Campus Madrid de Google como clara apuesta del potencial presente y futuro de la impresión 3D a nivel profesional. EDDM Solutions se dedica a la consultoría estratégica y al desarrollo de productos especialmente diseñados y pensados para fabricación aditiva e impresión 3D profesional. Además desde su división de formación EDDM Training ha desarrollado, además de cursos de impresión 3D profesionales, el primer Máster en Ingeniería y Fabricación Aditiva MIFA, que se centra en formar específicamente en impresión 3D profesional. Cuando alguien necesita un órgano tiene que esperar a que alguien decida donar uno propio. En España podemos frotarnos los nudillos contra el pecho. Somos el país con más donaciones del mundo, y lo llevamos siendo durante varios años. Aunque es una buena noticia a la mayoría de los pacientes la espera les desespera. Muchas veces el órgano no llega a tiempo para salvar vidas. Es algo en lo que muchas empresas ya están trabajando. Una de ellas es la española Regemat 3D, compañía biotecnológica centrada en el desarrollo de impresoras capaces de crear prótesis con tejidos vivos. "Nuestras impresoras permiten desarrollar lo que nosotros denominamos 'andamiajes'. Están elaborados en materiales plásticos que a altas temperaturas se moldean. Ese andamio, esa prótesis, se rellena con biotinta, es decir, con colágeno, ácido hialurónico, moléculas activas, algas... En función del órgano o tejido que haya que emular, se necesitarán unos compuestos u otros", manifiesta Gloria Pinilla, responsable de desarrollo de negocios de Regemat 3D. Sin embargo en México sí están permitidos los ensayos clínicos, y es justo lo que está haciendo la compañía. El proceso para crear un órgano biológico es el siguiente. En primer lugar se realiza un TAC (Tomografía Axial Computarizada) que escanea la zona a recrear. Imaginemos que se desea reconstruir un menisco con su correspondiente cartílago. Con el mapa de ese menisco malogrado, se realizaría una reconstrucción virtual del mismo en 3D. Después, desde la impresora se realiza una prótesis en un material de tipo plástico, como el comentado anteriormente, que se va rellenando con tejido vivo. Las bioimpresora son similares a las impresoras que puedes encontrar en la oficina o en los hogares, con algunas modificaciones. En el caso de las de la compañía que nos ocupa, sus bioimpresoras están compuestas por varias jeringuillas que añaden paulatinamente las diferentes sustancias para generar el tejido. Sería el equivalente a los tóner que distribuyen la tinta en las impresoras comunes. La impresora está conectada a un ordenador que recibe toda la información necesaria para desarrollar la prótesis. La bobina que se ve a la izquierda de la fotografía es un 'ovillo' de material plástico con el que se creará la prótesis. La impresora calienta el hilo y esculpe la prótesis, siguiendo los planos en 3D que se hayan cargado en el ordenador para elaborar la impresión. Mientras, las jeringuillas van incorporando el material biológico necesario. Un proceso que se alargará durante horas, en función de la complejidad del trabajo. En la actualidad hospitales como La Paz, en Madrid, o Vall d'Hebron en Barcelona, ya trabajan e investigan con este tipo de bioimpresoras. El coste de estas unidades es de unos 18.000 euros, aunque no se puede poner un precio genérico. "No fabricamos máquinas en serie. Nosotros apoyamos a los investigadores en la parte técnica y relativa a la impresora y hacemos de nexo entre todos los grupos de investigación a nivel mundial, que además nos dan claves para ir evolucionando cada impresora en función de lo que se necesite en cada área. Por eso cada equipo tiene un precio diferente, porque se hacen a la carta. En función de la cirugía que vaya a tratar y del proceso de ingeniería que implique el desarrollo de la bioimpresora, costará más o menos", explica Pinilla. Un proyecto español de colaboración público-privada desarrollará durante los próximos tres años sistemas de bioimpresión y biotintas para la regeneración tridimensional del cartílago y el hueso con el objetivo último de llegar a la aplicación clínica en las lesiones osteocondrales (las que afectan principalmente a las articulaciones de la rodilla y de la parte inferior del tobillo). El nuevo proyecto está financiado por el programa Retos-Colaboración del Ministerio de Economía, Industria y Competitividad. Cuenta con un presupuesto de 691.000 euros y la participación de dos empresas españolas (Bioibérica y Regemat3D), el Consejo Superior de Investigaciones Científicas (CSIC), la Universidad de Granada, el Centro de Investigación Biomédica en Red de Bioingeniería, Biomateriales y Nanomedicina (CIBER-BBN) y su ICTS Nanbiosis. Las empresas y grupos de investigación participantes en este proyecto trabajarán en la fabricación de piezas malladas tridimensionales o andamiajes diseñados con sistemas de bioimpresión 3D. Estas piezas serán alimentadas con células que posibilitan la generación de tejidos in vitro para regenerar lesiones. El objetivo último es el desarrollo de nuevas biotintas (en las que se combinen las piezas malladas y las células) que se implanten en hueso y cartílago. “La bioimpresión de tejidos está generando mucha expectación tanto en el ámbito académico como en el industrial. Además, la alta prevalencia de las lesiones articulares hace que sean muy interesantes como primera aplicación de la bioimpresión, con vistas a su uso en la práctica clínica”, explica Patricia Gálvez, directora de la Unidad de Terapias Avanzadas de Bioibérica, empresa coordinadora de este proyecto. La empresa Regemat3D ha desarrollado un sistema de dispositivos para la bioimpresión pionero a nivel mundial. Este sistema, destinado a grupos de investigación en su versión inicial, permite bioimprimir piezas malladas tridimensionales cargadas con diversos tipos de células (condrocitos y células troncales mesenquimales) para la regeneración de cartílago. Esta tipología de tejido presenta una serie de ventajas frente a otras por su relativa simplicidad, y sobre todo porque no hace falta que se haya realizado un cultivo previamente. Desde el punto de vista científico hay varias mejoras que realizar en el área de la bioimpresión 3D para conseguir que esta tecnología tan prometedora pueda ser utilizada en la clínica con garantías de éxito. Es necesario el desarrollo de nuevos biomateriales para las piezas malladas que imiten a los materiales biológicos con propiedades mecánicas y químicas similares. Estos biomateriales tienen que ser imprimibles y sus parámetros tienen que ser controlables. Es necesario, además, el acceso a una bien caracterizada y reproducible fuente de células para alimentar estas piezas que puedan ser obtenidas en grandes cantidades para poder reparar áreas amplias de tejido. Además, se tienen que poner a punto los procesos de tratamiento celular y el desarrollo de nuevas biotintas, así como adaptar el sistema de bioimpresión a los mismos. Para esta tarea han unido sus fuerzas Regemat3D; Bioibérica; el Grupo Nanobiocel del Ciber-BBN; el grupo de investigación CTS-205 del departamento de Farmacia y Tecnología Farmacéutica y el grupo de investigación CTS-963 de ‘Terapias Avanzadas: Diferenciación, Regeneración y Cáncer’, ambos pertenecientes a la Universidad de Granada; y el grupo de Biomateriales del Instituto de Ciencia y Tecnología de Polímeros del CSIC, también perteneciente al Ciber-BBN. Todas estas empresas y grupos de investigación aportan su know-how en bioimpresión, desarrollo de productos farmacéuticos para el tratamiento de lesiones articulares, y terapias celulares y biomateriales, de forma que se constituye un consorcio multidisciplinar con amplias garantías de éxito. El Centro de Investigación Biomédica de la Universidad de Granada (CIBM) reúne investigadores, programas de investigación, docencia de postgrado, recursos económicos y medios instrumentales suficientes para buscar el avance del conocimiento, el desarrollo y la innovación en Biomedicina y Biotecnología, mediante la investigación científica de excelencia. 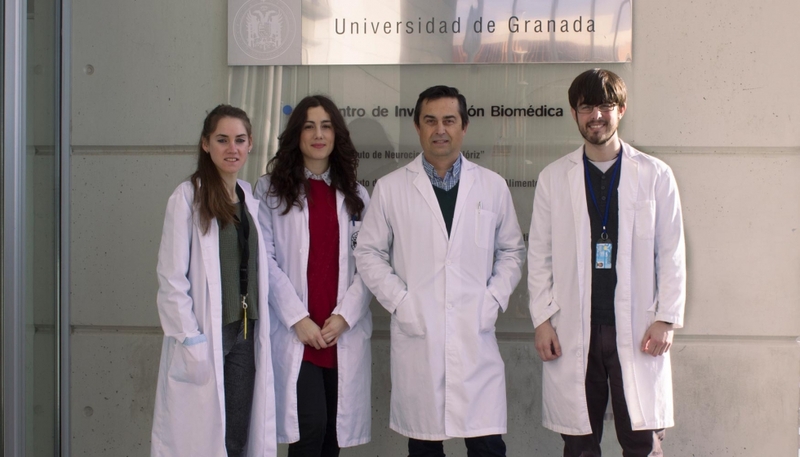 El grupo de investigación ‘Terapias avanzadas: diferenciación regeneración y cáncer (CTS-963)’ pertenece al Instituto IBIMER del CIBM y al Instituto de Investigación Biosanitaria de Granada (ibs.Granada). Su actividad investigadora se centra en el estudio de los procesos de diferenciación, desarrollo normal y patológico. Esta investigación es claramente traslacional, con posibilidad de aplicación diagnóstica y de utilización terapéutica. El grupo ha co-desarrollado un sistema de biompresión 3D con la empresa Regemat 3D y llevará a cabo en este nuevo proyecto los estudios de validación preclínica de las nuevas biotintas y las mallas tridimensionales utilizando muestras provenientes de pacientes con osteoartritis. Por su parte, la caracterización y estudio de estabilidad de las biotintas será asumida por investigadores del grupo CTS-205, en el Departamento de Farmacia y Tecnología Farmacéutica, el cual cuenta con una amplia experiencia en este campo, siendo sus principales líneas de actuación la nano y microencapsulación, y el diseño de formas de dosificación para una amplia variedad de activos (fármacos, nutrientes, cosméticos y células). Su constante actividad investigadora ha propiciado varias patentes, así como la colaboración con la industria farmacéutica, al objeto de mejorar y controlar diferentes formas farmacéuticas adecuadas a principios activos de gran interés terapéutico. Este nuevo proyecto de investigación traslacional supone un importante paso adelante hacia el objetivo de transferir estos prometedores resultados a la sociedad, siendo esta la función de la Oficina de Transferencia de Resultados de Investigación (OTRI), unidad encargada de promover y gestionar este tipo de proyectos colaborativos. Diferentes centros españoles de investigación y dos empresas han puesto en marcha un proyecto de colaboración por el que durante los tres próximos años buscarán desarrollar sistemas de bioimpresión en tres dimensiones y biotintas para regenerar cartílago y hueso para lesiones osteocondrales, que afectan a las articulaciones de la rodilla y parte inferior del tobillo. En la iniciativa participan el Consejo Superior de Investigaciones Científicas (CSIC), la Universidad de Granada y el Centro de Investigación Biomédica en Red de Bioingeniería, Biomateriales y Nanomedicina (CIBER-BBN), junto a las empresas Bioibérica y Regemat3D, y cuentan con un presupuesto de 691.000 euros. El objetivo último es fabricar piezas malladas tridimensionales o andamiajes diseñados con sistemas de bioimpresión 3D, que serán "alimentadas" con células que posibilitan la generación de tejidos 'in vitro' para regenerar lesiones. "La bioimpresión de tejidos está generando mucha expectación tanto en el ámbito académico como en el industrial. Además, la alta prevalencia de las lesiones articulares hace que sean muy interesantes como primera aplicación de la bioimpresión, con vistas a su uso en la práctica clínica", ha explicado Patricia Gálvez, directora de la Unidad de Terapias Avanzadas de Bioibérica, empresa coordinadora de este proyecto. La otra empresa de este proyecto, Regemat3D, ya ha desarrollado un sistema de dispositivos para la bioimpresión pionero que permite bioimprimir piezas malladas tridimensionales cargadas con diversos tipos de células (condrocitos y células troncales mesenquimales) para la regeneración de cartílago. Esta tipología de tejido presenta una serie de ventajas frente a otras por su relativa simplicidad, según explican en un comunicado, sobre todo porque no hace falta que se haya realizado un cultivo previamente. Sin embargo, desde el punto de vista científico hay varias mejoras a realizar en el área de la bioimpresión 3D para conseguir que esta tecnología tan prometedora pueda ser utilizada en la clínica con garantías de éxito. Entre otras cuestiones, es necesario el desarrollo de nuevos biomateriales para las piezas malladas que imiten a los materiales biológicos con propiedades mecánicas y químicas similares, que tienen que ser imprimibles y sus parámetros tienen que ser controlables. Asimismo, precisan una fuente de células para alimentar estas piezas que puedan ser obtenidas en grandes cantidades para poder reparar áreas amplias de tejido, y se tienen que poner a punto los procesos de tratamiento celular y el desarrollo de nuevas biotintas, así como adaptar el sistema de bioimpresión a los mismos. José Manuel Baena, director de Regemat 3D, empresa de Granada (España) recientemente distinguida con el premio emprendedor XXI de Andalucía, ha declarado a la prensa local que están preparando un ensayo clínico en México que supondrá la primera prueba en pacientes de sus tejidos para regeneración en 3D. Lo que hacen en Regemat es elaborar un software con el que imprimir en 3D tejidos o piezas personalizadas según diseño o segmentación obtenida a través de TAC o Resonancia Magnética. Pero tienen un extra más. Han ideado lo que llaman bioimpresión, que permite configurar las partes de la pieza donde inyectar o depositar células madre que suponen una gran novedad en la impresión 3D, ya que se podría regenerar la pieza a partir de esas células madre. "La novedad es imprimir en 3D una pieza con la geometría que quieras y configurarla para inyectar células de forma que ya tenemos una pieza en 3D a medida y con células repartidas con capacidad de regenerar tejido porque vienen de células madre", destacó José Manuel Baena. Así, el objetivo final será que un paciente con patología o necesidad médica pueda tener esta pieza en 3D y que con las células se vaya regenerando. "En muchas aplicaciones todavía queda mucha investigación para regenerar ciertos tejidos, pues nuestro producto puede añadir la bioimpresión y adaptar la máquina a cada pieza", explica. En lo que más trabajan es en regeneración de cartílago. Lo que Regemat ofrece a grupos de investigación y centros sanitarios es un programa y la adaptación de la bioimpresora para la realización de esas piezas. Ya tienen en EEUU, México, Colombia, Portugal, Inglaterra, Escocia.... "Hablamos con el grupo de investigación para saber qué quiere hacer, qué aplicación clínica y qué quieren comprobar y se desarrolla la bioimpresora ya preparada para esas necesidades. El diseño es específico. Cada impresión es única". Ya están validando todos los permisos para el trabajo con células humanas ya que la máquina se usa para investigación y están en proceso de llegar a la aplicación clínica en un proyecto en México de bioimpresión con células mesenquimales para regenerar cartílago. Será el primer trabajo de Regemat directamente en pacientes. Con estos avances, la pregunta es clara. ¿Hasta dónde se puede llegar? "Hay que ir paso a paso. Lo que ahora se hace con material sintético hay que ir convirtiéndolo en bioimpreso y que desaparezca. Hay que seguir trabajando mucho. Primero el cambio de material sintético por otro que se degrade, ponerle células y a partir de ahí donde se pueda llegar". Por ejemplo, en el campo de reconstrucciones, en lugar de tener que coger huesos de otras partes del cuerpo, poder regenerar tejidos. Y Regemat ya trabaja en dar esas herramientas a los investigadores. "Estamos en el comienzo. Se conseguirá hacer un órgano tridimensional con células y que sea funcional. Por eso estamos aquí", asegura Baena. La empresa granadina Regemat 3D, dedicada a la comercialización de sistemas de bioimpresión 3D de tejidos, ha sido galardonada con el Premio Emprendedor XXI Andalucía 2016, por parte de "la Caixa", a través de Caixa Capital Risc; la Consejería de Economía y Conocimiento de la Junta de Andañucía (España), a través de Andalucía Emprende, y el Ministerio de Industria, Energía y Turismo español, mediante Enisa, por su alto potencial innovador. Como premio, la empresa ha recibido una dotación económica de 5.000 euros, la participación en un curso de aceleración del negocio en la Universidad de Cambridge --Ignite Fast Track-- y acceso preferente a financiación de esta entidad financiera y a un programa de acompañamiento de Caixa Capital Risc, que apoya a los emprendedores en la búsqueda de mercados, sectores y personas que pueden ser claves para el desarrollo de su empresa. El galardón ha sido entregado en Málaga por el delegado territorial de CaixaBank en Andalucía y Murcia, Juan Ignacio Zafra; la directora gerente de Andalucía Emprende, Montserrat Reyes; el responsable de Operaciones, Promoción y RRII de Enisa, Javier Sánchez, y el presidente de la Confederación de Empresarios de Andalucía (CEA), Javier González de Lara, entre otros. Zafra ha destacado que se han presentado un total de 61 proyectos "de altísimo nivel", y se ha mostrado "satisfecho" por que los premios alcancen los diez años de existencia. Además, ha manifestado sentirse "orgulloso" de los proyectos, ya que "demuestran el nivel de emprendimiento de Andalucía, una tierra llena de sensibilidad para emprender e imaginación", ha indicado. Por su parte, Reyes ha dicho que es "un lujo" trabajar con "la Caixa" en iniciativas de este tipo y ha puesto de relieve los proyectos, que son de emprendedores de "máximo nivel, con gran dosis de creatividad y tecnología", ha señalado. Igualmente, ha resaltado el "compromiso" de la entidad financiera por "el emprendimiento y el bien colectivo" y el del Gobierno andaluz, que "sabe que --el emprendimiento-- es la única manera de dar solidez y de generar expectativas" en la Comunidad. Asimismo, el responsable de la CEA ha señalado que los premios "engrandecen la figura de quienes son los verdaderos protagonistas del cambio en Andalucía: los que están apostando con su talento, su iniciativa y su compromiso". El acto también ha contado con la participación del alpinista y escalador Ferrán Latorre, que ha impartido una conferencia sobre su experiencia en estos deportes, poniendo de relieve los nexos entre el alpinismo y los negocios. La décima edición de este certamen, promovido por "la Caixa", con la colaboración del Ministerio de Industria, Energía y Turismo, a través de Enisa, y de Andalucía Emprende, tiene como objetivo reconocer a los emprendedores andaluces con mayor potencial de crecimiento a nivel nacional. Como ganadora de la fase autonómica de los Premios Emprendedor XXI, Regemat 3D participará en la fase nacional, en la que competirá por conseguir una dotación económica de 25.000 euros y acceso gratuito al programa de acompañamiento 'Peer-to-Peer Advisory Board' de jóvenes empresas en crecimiento. El ganador nacional se dará a conocer en el mes de noviembre, en la gala oficial de entrega de los Premios Emprendedor XXI 2016. Como finalistas han quedado las empresas malagueñas Garbionda Mantenimiento Sostenible, que ofrece servicios de I+D+i para infraestructuras de seguridad y contención en carreteras; Métrica 6 Ingeniería, desarrolladora de productos y servicios tecnológicos basados en I+D+i; Ovobank, primer banco de donantes de óvulos de Europa; así como la empresa EC2EC, 'start-up' tecnológica fundada en Sevilla y dedicada al desarrollo de modelos predictivos con aplicación al sector agrícola. Un total de 61 empresas de Andalucía se han presentado a la décima edición de estos premios, considerados de referencia para proyectos de innovación en España, siendo 600 las firmas andaluzas de nueva creación que han participado en la iniciativa desde que se creó, en el año 2007. El Premio Emprendedor XXI nace en 2007 con el objetivo de identificar, reconocer y acompañar a las empresas innovadoras de reciente creación con mayor potencial de crecimiento de España. Este año cuenta con una fase autonómica, una fase estatal y dos accésits gracias a la colaboración de entidades regionales de referencia implicadas en el apoyo al desarrollo de las empresas innovadoras. Este reconocimiento consta de cinco premios sectoriales de ámbito estatal, dirigidos a las empresas con mayor potencial de crecimiento en su sector, y 17 premios regionales, para las empresas con mayor impacto en su comunidad autónoma. Además, se otorgan dos áccesits, uno a la mejor innovación tecnológica y otro al proyecto con mayor impacto social en su entorno. Las 17 empresas ganadoras autonómicas obtienen una dotación económica de 5.000 euros, un curso de aceleración en la Universidad de Cambridge, denominado Ignite Fast Track, acceso preferente a los vehículos de inversión de Caixa Capital Risc y Enisa para empresas en etapas iniciales y acceso al programa de acompañamiento para empresas en crecimiento de Caixa Capital Risc. Por su parte, la empresa ganadora a nivel nacional obtiene una aportación económica de 25.000 euros en metálico; acceso gratuito durante seis meses al programa de acompañamiento 'Peer-to-Peer Advisory Board' de jóvenes empresas en crecimiento, de la mano de un 'coach'; y acceso preferente a los vehículos de inversión de Caixa Capital Risc y Enisa para empresas en crecimiento y al programa de acompañamiento para empresas en crecimiento de Caixa Capital Risc. Asimismo, la firma ganadora podrán optar al programa 'Start', dirigido a empresas de desarrollo de tecnología que están aún lejos del mercado, y al programa de internacionalización, para aquellas con un producto o servicio en el mercado o que están a punto de lanzarlo. Andalucía Emprende es una entidad adscrita a la Consejería de Economía que fomenta la cultura emprendedora y la actividad empresarial andaluza mediante actuaciones y servicios de apoyo a personas emprendedoras, destinados a impulsar la creación y el desarrollo de empresas y empleo en el territorio. Caixa Capital Risc es la sociedad gestora de empresas de capital riesgo de "la Caixa", que invierte en las primeras etapas de compañías españolas innovadoras con un elevado potencial de crecimiento y las acompaña en las diferentes etapas de su crecimiento. La Empresa Nacional de Innovación S.A. (Enisa) es una empresa pública dependiente del Ministerio de Industria, Energía y Turismo, a través de la Dirección General de Industria y de la Pequeña y Mediana Empresa. Desde 1982 participa activamente en la financiación de proyectos viables e innovadores, impulsados por pymes y emprendedores. La empresa es pionera en la bioimpresión de tejidos y comercializa sus sistemas. Entre las empresas finalistas se encuentran también Ec2ce, Garbionda, Métrica6 Ingeniería y Ovobank. 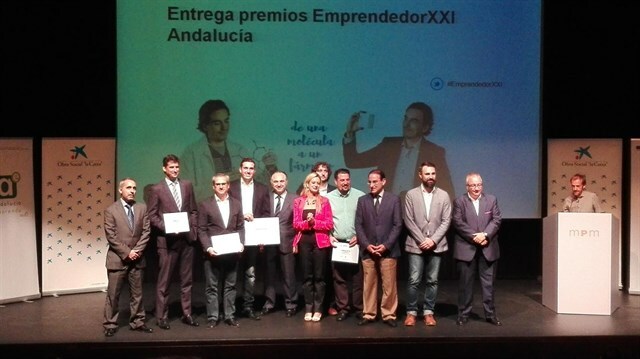 La empresa Regemat 3D ha resultado ganadora de la décima edición de los Premios Emprendedor XXI en Andalucía. La firma es pionera en la bioimpresión de tejidos y se dedica a la comercialización de dichos sistemas, que integran tanto la tecnología de fabricación aditiva por capas, como la tecnología de bioreactores y las terapias regenerativas con células madre. El galardón está impulsado por La Caixa, a través de Caixa Capital Risc (gestora de capital riesgo del grupo bancario) y co-otorgado por el Ministerio de Industria, Energía y Turismo, a través de Enisa. En el caso de la comunidad autónoma, también ha participado, como entidad organizadora, Andalucía Emprende. La compañía granadina ha obtenido un premio en metálico de 5.000 euros y una beca para ingresar en el curso intensivo de aceleración empresarial 'Ignite Fast Track', impartido en la Universidad de Cambridge (Reino Unido). El objetivo de estos premios es, según La Caixa, "identificar, reconocer y acompañar a las empresas con mayor potencial de España". Los proyectos finalistas han sido EC2CE, una start up fundada en Sevilla y especializada en la generación de modelos predictivos a partir de inteligencia artificial con aplicación al sector agrícola; Garbionda (Málaga), una firma de I+D+i dedicada a conseguir carreteras más seguras y sostenibles; Métrica6 Ingeniería (Málaga), que trabaja para crear un servicio tecnológico cercano a las necesidades de los consumidores con productos a medida; y, la también malagueña, Ovobank, primer banco de óvulos de donantes de Europa. Se trata de cuatro finalistas de un total de 61 empresas que se han presentado en la décima edición de los Premios Emprendedor XXI Andalucía. Desde la creación de estas distinciones en 2007, se han invertido 3,67 millones de euros en premios y acciones de acompañamiento que han beneficiado a 232 empresas. El acto de entrega ha estado presidido por la directora gerente de Andalucía Emprende, Montserrat Reyes, y el director territorial de CaixaBank en Andalucía y Murcia, Juan Ignacio Zafra. Este último ha destacado que "de las dificultades y de que parece que no es el mejor momento, hay muchísimos emprendedores que todos los días salen ahí fuera a ganarse la confianza de la sociedad". Por su parte, Montserrat Reyes alabó "el potencial y el talento innovador de Andalucía como lo han demostrado las 61 candidaturas que han concurrido a este premio". Various technological advances in tissue engineering have brought us closer to the point where creating organs and 3D tissues under laboratory conditions becomes plausible. What is the current state of development of these state-of-the-art techniques? What challenges lie ahead? What has the biotechnology industry contributed and what new opportunities are opening up for it in this area? A panel of international experts will debate the scientific, technological, social and economic implications of this revolutionary step forward in biomedicine. Santiago de Compostela, 26 de septiembre de 2014. Actualmente, el desarrollo de un nuevo medicamento, que abarca desde las distintas fases de investigación hasta que llega a comercializarse en el país, suele durar unos 10 años. Sin embargo, una nueva técnica, la bioimpresión 3D, podría acelerar este proceso y acortarlo solo a tres. Así lo ha presentado José Manuel Baena, CEO de Breca Health Care, quien ha explicado su proyecto de bioimpresión 3D de tejidos tisulares en la mesa Building organs: milestones and challenges in tissue engineering, celebrada en el marco del 7º Encuentro Internacional de Biotecnología, BioSpain 2014. La bioimpresión es la impresión 3D paralelamente y en combinación con productos farmacéuticos como hidrogeles, biomoléculas, proteínas o células autólogas. “La bioimpresión de tejidos va a revolucionar el ámbito sanitario. Pero la necesidad no solo está en llegar a crear con esta técnica un órgano para trasplantar. La primera necesidad es la de generar modelos tisulares para la prueba de fármacos, con lo que conseguiríamos que en vez de desarrollarlo en 10 u 11, podamos tenerlo aprobado en tres o cuatro. Es un avance muy significativo”, explica este especialista. “La puerta está abierta a la ingeniería tisular y la organogénesis”, ha afirmado Luiz Sampaio, del Texas Heart Institute, de Estados Unidos, otro de los ponentes de la mesa. Durante su intervención, el experto ha hablado de las promesas, progreso, obstáculos y oportunidades en la fabricación de órganos. “Ya ha sido posible el trasplante de una tráquea y una vejiga en humanos y mi optimismo me dice que se hará con un corazón en no más de 10 años”, señala. En este ámbito hay 565 estudios registrados y otros 220 se encuentran en fase de reclutamiento. La falta de financiación, eso sí, es “uno de los principales obstáculos que hacen peligrar el desarrollo futuro de la ingeniería tisular”, indica. Un millón de euros y asesoramiento profesional garantizado para poner en marcha su iniciativa. Con estos credenciales se presentó, hace unos meses el premio TEDxBenninhof hecho en Europa 2016, un proyecto que ha puesto en marcha Holanda con motivo de su periodo de presidencia del ente comunitario. Durante el primer semestre del 2016 Países Bajos se hará cargo del gobierno de la Unión Europea, y ha decidido que una de sus principales propuestas será este premio, con el que se pretende reconocer el talento de las pequeñas y medianas empresas a la hora de innovar. El mecanismo es sencillo: cada país miembro de la Unión Europa presentará una pyme candidata que viajará hasta Luxemburgo para presentar, entre el 18 y el 20 de noviembre, su idea. De las 28 llamadas a la pelea, sólo nueve serán las elegidas por un jurado que votará en función de la capacidad de estas empresas para llevar a cabo su idea y de lo que dicha iniciativa pueda aportar al proyecto común europeo. Por supuesto, la innovación también será algo en lo que se fijarán los expertos. Además, una empresa más completará la decena de candidatas, aunque esta última pyme será elegida por una encuesta popular online en la que cualquiera podrá votar entre el 20 de noviembre y el 13 de diciembre. Como era de esperar, el camino para representar a cada país en esta suerte de Copa de Europa de la innovación no es nada sencillo. En España la criba la ha realizado la Dirección General de Industria y de la Pequeña y Mediana Empresa (DGIPYME), que ya ha anunciado a las 10 finalistas que se jugarán un billete con destino a Luxemburgo. La lista la componen Aquareturn, especializada en el ahorro de agua y el cuidado del Medio Ambiente, Enigmedia, que presenta un proyecto para mejorar la seguridad en las telecomunicaciones, Infantium, enfocada a la educación especial infantil o Irisbond, que desarrolla software informático. Otros aspirantes son Koiki Home, una pyme de logística urbana, Onix Solar, especializada en energía fotovoltaica, o Regemat 3D, con una iniciativa orientada al desarrollo de aplicaciones médicas con impresoras 3D. La lista la cierran Toys2Help, UsMIMAy Hackity Social Design, empresas especialistas en reciclaje de juguetes, asistencia sanitaria a domicilio y diseño respectivamente. Con el plazo para presentar nuevas iniciativas ya cerrado, sólo queda conocer el nombre del aspirante español. Países como Bulgaria, Chipre, Alemania, Francia, Suecia o Dinamarca ya han dado a conocer a sus candidatos para pelear por el millón de euros y asesoría especializada. El nombre del proyecto que se hará con el botín se hará público en un encuentro en La Haya el próximo 31 de marzo de 2016. Estos premios nacen con la idea de presentar al mundo que la Unión Europa tiene una gran capacidad de innovación y de emprendimiento. Además, servirá como piedra de toque a las pymes españolas para saber en qué punto se encuentran a la hora de competir contra sus rivales en el cada vez más ansiado mercado continental. Los límites de la impresión en 3D: ¿podremos teletransportarnos algún día? Si los tejidos óseos o cartilaginosos están entre los primeros candidatos para replicar nuestro cuerpo, ¿qué partes podrán reproducirse posteriormente y cuáles no podríamos emular si pretendiéramos imprimir humanos cual figurita del comandante Spock? "Tenemos la tecnología mecánica, electrónica e informática de la impresora 3D, la ciencia de los biomateriales y las células madre que nos permitirán poner todo en conjunto", señala José Becerra, director científico de Bionand, el Centro Andaluz de Nanomedicina y Biotecnología. Con la combinación de esas tres tecnologías, se podrán componer algunos órganos, si bien habrá que realizar una intensiva experimentación 'in vitro' con biorreactores, sistemas que permiten que las células sigan viviendo y les lleguen los nutrientes, antes de llegar a realizar una investigación preclínica con ciertas garantías. Este catedrático de Biología Celular en la Universidad de Málaga e investigador del Centro de Investigación Biomédica en Red BBN estima que en un periodo de entre 5 y 25 años se podrán llegar a fabricar artificialmente esos primeros órganos sencillos y esbozos de otros más complejos, que después tendrán que evaluarse para comprobar si pueden ser verdaderamente trasplantados a pacientes de la mano de la medicina regenerativa. La epidermis contiene pocas capas de células y no está vascularizada, por lo que la piel podría ser el primer órgano que se conseguirá fabricar por impresión 3D y trasplantar a humanos. La tráquea o la vejiga también podrán fabricarse en unos pocos años. "La vejiga tiene muy pocos tipos celulares, estamos hablando de las células que tapizan la luz del órgano que se distienden cuando el globo está lleno y se encogen cuando el globo se vacía", detalla José Becerra. Por eso, cree que veremos una vejiga impresa en 3D antes que un hígado o un riñón, órganos que tardarán más en ser creados artificialmente. 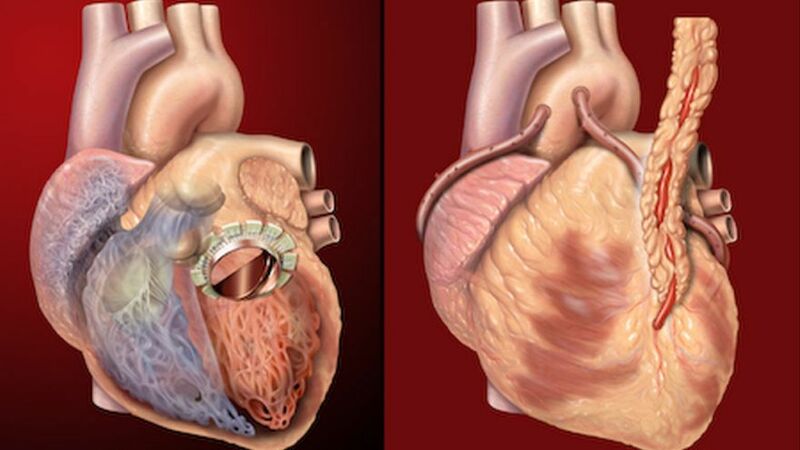 Investigadores del Instituto de Innovación Cardiovascular de la Universidad de Louisville han asegurado que, en ocho años, será posible crear el primer corazón completo impreso en 3D. Engel prefiere no poner fecha a esa creación, pero incide en que el corazón es un órgano muy complejo y con muchos tejidos, lo que se suma al problema de recrear su comportamiento mecánico, por lo que cree que será uno de los últimos órganos en poder reproducirse. "Puedes implantar un andamio con condrocitos a un paciente, pero si las células no forman cartílago funcional, el paciente no se muere. Ahora, si implantas un corazón que no funcione, imagina lo que le puede llegar a pasar", añade José Manuel Baena, CEO de Regemat. Evidentemente, el órgano que ni siquiera podemos vaticinar si será algún día replicable es nuestro desconocido y complejo cerebro, cuyos secretos pretenden descifrar, en un futuro, iniciativas como el ambicioso Human Brain Project. El director científico de Bionand no cree que la impresión del cerebro sea viable "en absoluto", teniendo en cuenta la complejidad de las funciones de coordinación e integración que realiza: "No tenemos todavía una visión clara sobre su funcionamiento, difícilmente se puede pensar en su reproducción por estos procedimientos”. Por el momento, un equipo de científicos australianos ha desarrollado un método para imprimir estructuras cerebrales usando neuronas de ratones preservadas en un hidrogel que fueron capaces de sobrevivir y conectarse entre ellas.
" Utilizar las células de los propios pacientes nos hará posible entender cómo se desarrollan las enfermedades neurológicas y probar nuevas terapias", nos explica Gordon Wallace, director del Instituto de Investigación de Polímeros Inteligentes de la Universidad de Wollongong de Australia. Eso sí, considera que, al menos hasta dentro de una década, no se podrá determinar cuáles serán los límites de esta tecnología. La impresión 3D es un campo en plena ebullición, sobre todo, en lo que se refiere a sus posibles aplicaciones médicas. Cada vez son más las compañías que han apostado por el desarrollo de prótesis e implantes diseñados a través de esta técnica, que permite crear piezas a medida con mayores garantías de que no se produzca un rechazo. Es el caso de BRECA Health Care, que desde 2011 pone a disposición de los centros médicos que lo requieran prótesis personalizadas realizadas en titanio. «Es un sector muy nuevo pero que está evolucionando muy rápido», explicaba José Manuel Baena, CEO de la firma andaluza y socio fundador de la misma, hace unos meses en una entrevista para EL MUNDO. Esa evolución le ha llevado ahora a poner en marcha un nuevo proyecto empresarial para desarrollar la tecnología necesaria para la impresión de tejidos, una nueva disciplina conocida como bioprinting. «Nosotros damos el soporte técnico a los investigadores y empresas que quieran avanzar en este camino», asegura Baena. Regemat 3D «es la primera empresa española dedicada a la bioimpresión de tejidos», prosigue. El primer paso en este sentido lo han dado de la mano del Centro de Investigación Biomédica especializado en tratamientos celulares, y del investigador Juan Antonio Marchal, del departamento de Terapias Avanzadas, que trabaja en un proyecto para la regeneración de cartílago. Una impresora de "carne y hueso"
La empresa granadina Regemat 3D, con el joven José Manuel Baena al frente, ha diseñado la primera bioimpresora española, con aplicaciones para acelerar el desarrollo de fármacos, para reducir el uso de animales en ensayos clínicos y con el reto de lograr regenerar lesiones en órganos dañados. Lo de crear órganos completos en el laboratorio es una pugna que el hombre mantiene con la ciencia y con la naturaleza, con escasos resultados hasta el momento. En ese camino, una empresa granadina, Regemat 3D S.L, ha dado un salto considerable, al convertirse en la primera firma española en diseñar una bioimpresora de tejidos, esto es: una máquina que elabora mallas a base de hidrogeles que contienen células que reproducen las características de los tejidos vivos. Los productos de la bioimpresión tienen una gran aplicación en el campo de la medicina regenerativa. Las células en estos andamios tridimensionales se comportan de manera similar a cómo lo hacen en un organismo, debido a que las condiciones son más similares a las fisiológicas. Y estos productos bioimpresos pueden servir para acelerar el desarrollo de fármacos, para reducir el uso de animales en los ensayos preclínicos y -¿por qué no?- algún día para regenerar lesiones en los órganos dañados e incluso reemplazarlos. La tecnología que desarrolla la firma granadina busca un hueco en el mercado ofreciendo varias posibilidades. Con ella quieren acelerar las fases preclínicas -pruebas que se llevan a cabo en un contexto científicamente controlado con utilización de cultivos celulares y animales como modelos- y clínicas de las investigaciones, así como probar fármacos en estos tejidos elaborados mediante bioimpresión. Es cierto que existen dos decenas de empresas a nivel mundial que desarrollan productos similares a los de los granadinos, pero ellos han sido los primeros en hacerlo a nivel nacional, además están bien situados a nivel mundial, porque llevan más de ocho años trabajando en el uso sanitario de la impresión 3D. Regemat cuenta José Manuel Baena (Valencia, 1983) como director ejecutivo, quien ha iniciado esta andadura junto al investigador Juan Antonio Marchal, del grupo de Terapias Avanzadas, ubicado en el IBIMER del PTS, que trabaja en un proyecto para la regeneración de cartílago, además de ser catedrático de Embriología Humana en la Universidad de Granada. La impresión tridimensional es un campo en eclosión con miras en sus múltiples aplicaciones médicas. Ya se ha avanzado en el diseño y creación de prótesis e implantes a través de esta técnica, que logra piezas a medida con menores riesgos de rechazo. Antes de sacar el material por la impresora hay un concienzudo diseño del objeto en el ordenador gracias a sistemas de Software muy avanzados. Para quien aún ande perdido: donde antes mandabas a imprimir un folio, ahora lo haces con una prótesis de cadera, con una reconstrucción facial y, en el futuro, se aspira a que salga un cartílago o una córnea. José Manuel Baena -tras licenciarse en Ingeniería Industrial en la Politécnica de Valencia- termina ahora sus estudios de Doctorado en Biomedicina en la UGR, pero le ha dado tiempo a todo... En 2011, fundó la firma Breca Health Care y se convirtió en un pionero en el uso de la impresión 3D en el sector salud y empezó a poner a disposición de los centros médicos que lo requerían prótesis personalizadas realizadas en titanio. Según el joven, este nuevo sector está evolucionando muy rápido. Ellos, mediante sus nuevas bioimpresoras 3D, que cuestan alrededor de 9.000 euros, ya dan soporte técnico a los investigadores y empresas que quieran avanzar en este camino. «Con nuestra nueva 'start up' queremos que se pase de utilizar cultivos en 2D a 3D», señala Baena, autor del libro 'Emprender en carrera'. Para ésta, su última aventura empresarial, ha requerido la colaboración de la Universidad de Granada, el Hospital de la Paz de Madrid y el CSIC, así como con una empresa del sector farmacéutico. Aunque inicialmente la bioimpresora está configurada para fabricar algo semejante al cartílago, Baena y su equipo esperan que pueda utilizarse para huesos, piel u órganos como el colon en un futuro. Private investment in Spain confirms interest in the Biotechnology and Life Sciences sector Why burn bagasse when you can 3D print its nanocellulose Unique research requires unique equipment to achieve unique results. Bioimpresión, ¿una alternativa al trasplante de órganos? News about bioprinting in 2018 Radio 5 de RTVE - Entre probetas: La tecnología 3D llega a la medicina Bioprinting in Focus: Interview with José Baena, Founder and CEO of REGEMAT 3D and BRECA Healthcare ¿Llegará a ser la bioimpresión una alternativa a los trasplantes de órganos? 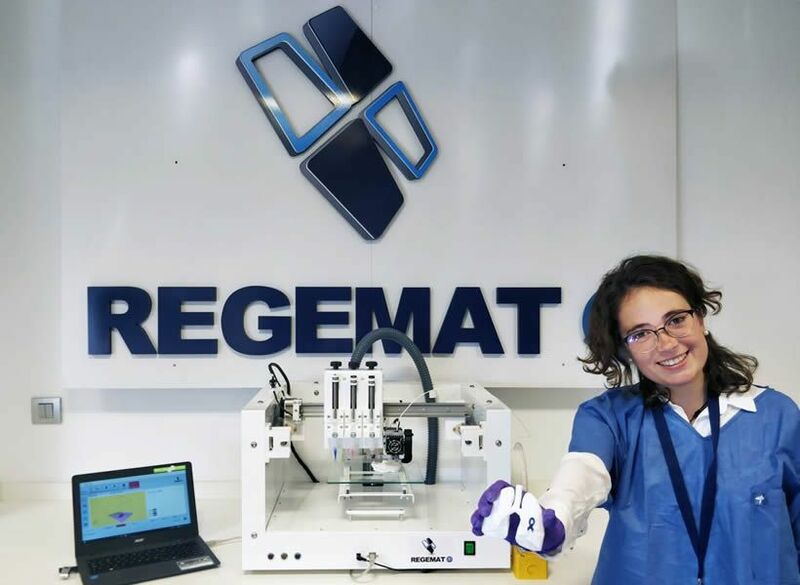 Spanish’s regenerative medicine leader REGEMAT 3D to solve the milestones of bioprinting in 2018 Charla Regemat 3D - Bioimpresión 3D de tejidos. Evento EDDM REGEMAT 3D Offers Customized Options for 3D Bioprinting CLAVES DEL ÉXITO EN LA IMPRESIÓN 3D Tinta biológica: así son las impresoras de órganos en 3D ¡TENEMOS NUEVO VÍDEO CORPORATIVO! Sistemas de bioimpresión 3D y biotintas para la regeneración de cartílago y hueso Científicos españoles desarrollan impresoras 3D para regenerar huesos y cartílagos Regemat 3D probará en México sus tejidos impresos en 3D Regemat 3D, dedicada a la bioimpresión 3D de tejidos, premiada por su potencial innovador La granadina Regemat 3D gana el Premio Emprendedor XXI andaluz REGEMAT3D IN BIOSPAIN 2014 Europa busca a la empresa más innovadora: Las 10 aspirantes españolas Los límites de la impresión en 3D: ¿podremos teletransportarnos algún día? Tecnología granadina para la impresión 3D de tejidos biológicos Una impresora de "carne y hueso"